Older Americans are a group that have a lot at stake in ongoing health system transformation initiatives. A vital goal of the Center for Consumer Engagement in Health Innovation is promoting the meaningful role older consumers can exercise when they lift up their voices. Several of our staff members recently met an older adult who perfectly exemplifies what it means to stand up and speak out loudly for better health out of one’s own life experience. Kathy Paul is a 69-year-old resident of Lynn, Massachusetts and an active member of the Massachusetts Senior Action Council. The Council, founded in 1981, is a statewide, grassroots, senior-led organization that empowers its members to use their own voices to address key public policy and community issues that affect their health and well-being. Kathy spoke out loudly at a press conference in Boston on May 8 [video courtesy of BNN – Boston Neighborhood Network] on the American Health Care Act, a bill that would result in significant cuts to care for older adults. The bill was passed by the U.S. House of Representatives and is now pending before the Senate. 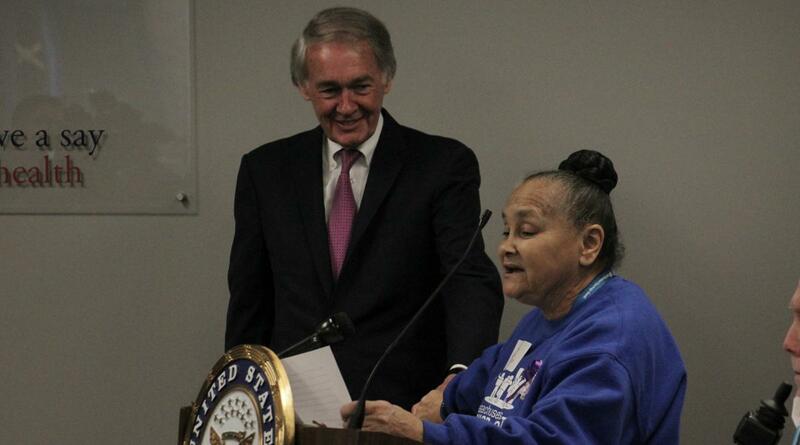 Kathy joined Sen. Edward Markey and other community leaders at the event, including speakers from Health Care For All, Community Catalyst, Health Law Advocates, Boston Medical Center GROW Clinic, Disability Advocates Advancing Our Healthcare Rights, Massachusetts Senior Action Council, Massachusetts Organization for Addiction Recovery, the American Cancer Society Action Network and the American Heart Association. In recent years, ‘taking charge’ for Kathy has meant testifying at the Massachusetts Statehouse against rate hikes for older adults using public transportation services and advocating for genuinely affordable housing options for older adults in the Commonwealth. And on a Monday morning in May, it meant joining hands with her United States senator and telling her story from the podium to a bank of television cameras and assembled reporters. We can’t wait to see what she’ll do next. During this month, let us know at @ccehi how you #AgeOutLoud! With our thanks to Kathy Paul for her guest contributions to this post.